The third installment in a fantasy game series launched in 2003, which combines elements of RTS and RPG. The title was produced by Grimlore Games, a studio founded by the series’ publisher, which employs some of creators of the first two SpellForce games. 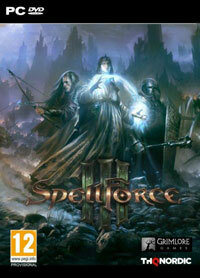 SpellForce 3 for PC is the third installment of the series of RTS and RPG crossover games from the Grimlore studio, the creators of the previous two editions of SpellForce, who work under the wings of the Nordic Games company. The storyline of SpellForce 3 takes place before the events of the first installment of the cycle, before the fantasy world has been torn into relatively small islands. The new time setting causes a complete change in the structure of locations – instead of dedicated regions connected via portals, the production features a consistent, large continent. The player controls his character and directs its progression similarly to a standard RPG title; the creators have prepared a variety of abilities, classes and specializations, which can be freely drafted to suit your playstyle. The main protagonist is accompanied by other heroes, during the exploration of dungeons and catacombs we can control a group of up to five characters; when running a larger team SpellForce 3 resembles some of the hack-and-slash type productions. The gameplay is focused around fighting small groups of enemies, solving puzzles and avoiding traps. On the planet’s surface the players can establish a camp and recruit troops to aid them in battle. The scale of skirmishes in the newest installment of SpellForce has been increased, which is also why the men we hire could easily be considered regular soldiers, who understand the meaning of strategy and can work together in fighting formations. Apart from the main story-focused missions the developers have prepared plenty of side quests and also a well-developed multiplayer mode. For the purposes of their new title, the Grimlore studio has created a Battle.net type service – SpellForce.net, which offers various options for interaction between players. SpellForce 3 uses a brand new game engine, capable of generating a detailed open world with entire virtual civilizations living within it. Game score 8.315 / 10 calculated out of 247 players' votes. Expectations before the premiere: 9.3 / 10 calculated out of 696 players' votes. This guide for SpellForce 3 contains a detailed walkthrough for campaign and side quests as well as descriptions of the game mechanics. You can also find information about all available races and their units.